on Saturday, 2nd of February in Mumbai. This full day workshop will provide participants with an in-depth understanding regarding the procedures, compliances and duties of mental health professionals/government authorities under the Act. 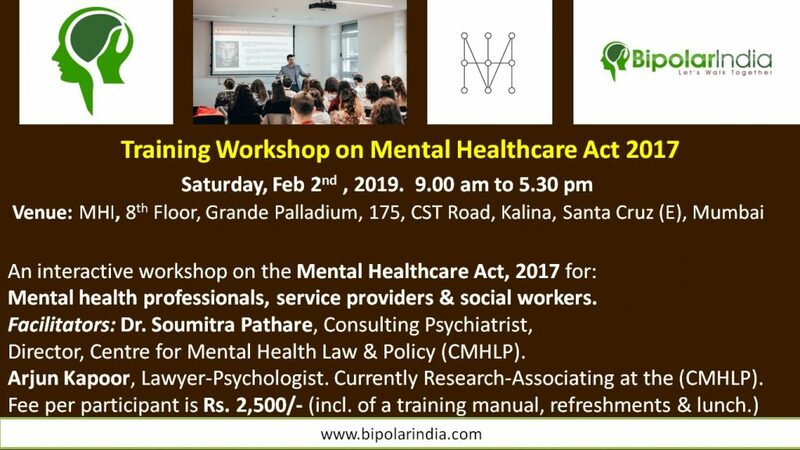 This interactive workshop on the implementation of the Mental Healthcare Act, 2017 is customised for mental health professionals, service providers & social workers. Attendance/Completion Certificates will be issued to those who require them. Director, Centre for Mental Health Law & Policy (CMHLP). Dr. Pathare is a Consultant Psychiatrist and provided technical assistance to the Ministry of Health & Family Welfare, Government of India in drafting the Act. Currently Research-Associating at the Centre for Mental Health Law & Policy (CMHLP). The workshop fee per participant is Rs. 2,500/- (inclusive of a training manual, refreshments and lunch). There will be slots for Q & A at end of each session. MHI, 8th floor, Grande Palladium, 175, CST Road, Kalina, Santa Cruz (E), Mumbai. This being an interactive training, there is an upper cap on the number of participants. Avail of this opportunity to arm yourself with knowledge about the MHCA, 2017, that is a game changer for the millions of Indians affected by mental illness. Register here. Only few seats remaining! ← Let’s Dare to Dream Big!